The main event on the economic calendar this afternoon has come from Canada with the latest look at price pressures in the country showing an unexpected rise. The consumer price index (CPI) Y/Y rose to +2.0% from 1.7% previously, and this amounts to a positive surprise for the Canadian dollar. Looking at the monthly figure it appears that the gain came largely due to a surprise jump in services inflation which rose by 0.5% M/M, while the Goods equivalent came in at -0.7% M/M. Perhaps surprisingly, energy declined by 3.7% M/M, despite the bounce we saw in the oil price towards the end of December, so the beat in the headline can’t really be explained away as being heavily influenced by the oil markets. 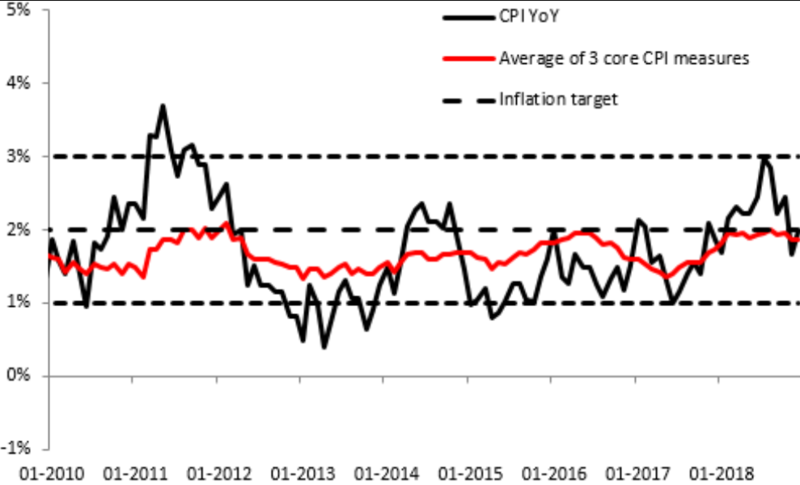 The core reading is now comprised of three additional metrics, the common, median and trimmed CPI. There was little change seen amongst these with both the common and trimmed remaining at 1.9% Y/Y, while the median dropped by 10 basis points to 1.8%. An average of these can be taken to give an overall feel and a “core” reading of inflation and this remains at 1.9% Y/Y - around the middle of the BOC’s 1-3% inflation target and close to the headline reading of 2.0% Y/Y. In terms of market reaction there has been a clear tick higher in the Canadian dollar, which is trading higher against all it’s other pairs barring the New Zealand dollar. The gains are fairly measured thus far, with the knee-jerk reaction off the headline being tempred a little by the core reading remaining unchanged. The NZDCAD is actually one of the most interesting markets involving CAD at present with a longer term head and shoulders potentially forming. This cross trades not far from a potential neckline in this setup at 0.8915 and a clean break below there would open up the possibility of a large move lower with a symmetrical target found at 0.8575.